Make do and unmend? 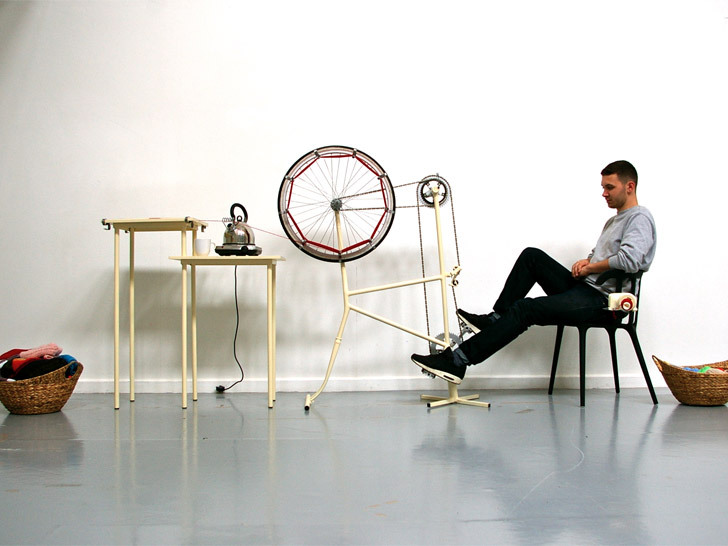 Meet the “un-knitting” machine, a pedal-powered apparatus designed to recycle unwanted knitwear. The curious contraption is the brainchild of Imogen Hedges, a London-based product-and-furniture designer who discovered that charity shops sometimes spend hours unraveling sweaters by hand. “They can make more money out of selling the wool than they can from the sweaters,” says the Kingston University graduate, one of a select group of student designers exhibiting at the The National Centre for Craft & Design this month. Built around an old bicycle frame, Hedges’s machine requires little more than a well-oiled pair of legs to run. The “un-knitter” sits on a chair on one end, unraveling the garment as it’s pulled along the circumference of the wheel. Wool, which retains its elasticity better than other fibers, works best, as do knits derived from continuous lengths of fiber. To eliminate kinks, the yarn passes through the steam of a electric kettle. Finally, it finds its way to a hand-cranked spindle, where it’s rewound into a ball for re-knitting. “With my machine you’d be able to take them apart and knit something new.” Hedges says. Hedges’s machine will be on display at the National Centre’s roof gallery from November 10 to January 6. Make do and unmend? Meet the "un-knitting" machine, a pedal-powered apparatus designed to recycle unwanted knitwear. The curious contraption is the brainchild of Imogen Hedges, a London-based product-and-furniture designer who discovered that charity shops sometimes spend hours unraveling sweaters by hand. �They can make more money out of selling the wool than they can from the sweaters," says the Kingston University graduate, one of a select group of student designers exhibiting at the The National Centre for Craft & Design this month.